At the end of January, Adobe published the security bulletin APSA15-01 for Flash Player, which fixes a critical use-after-free vulnerability affecting Adobe Flash Player 16.0.0.287 and earlier versions. This vulnerability, identified as CVE-2015-0311, allows attackers to execute arbitrary code on vulnerable machines by enticing unsuspecting users to visit a website serving a specially crafted SWF Flash file. The vulnerability was first discovered as a zero-day being actively exploited in the wild as part of the Angler Exploit Kit. 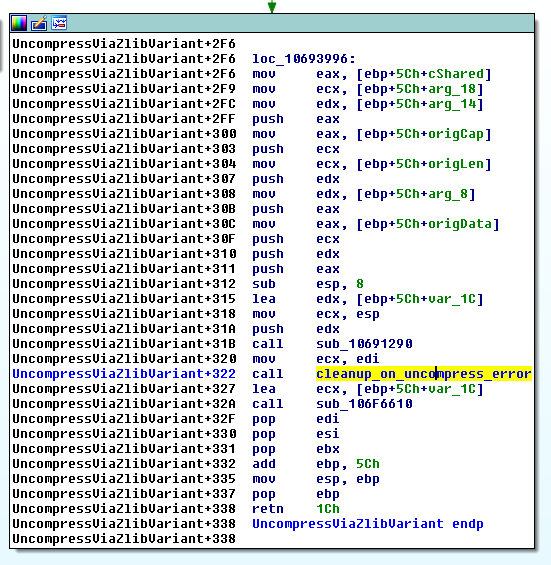 Although the exploit code was highly obfuscated using the SecureSWF obfuscation tool, malware samples taking advantage of this vulnerability became publicly available, so I decided to dig into the underlying vulnerability in order to exploit it and write the corresponding module for Core Impact Pro and Core Insight. When trying to decompress the data in a ByteArray previously compressed with zlib from ActionScript code, the underlying ActionScript Virtual Machine (AVM) will handle this operation in the ByteArray::UncompressViaZlibVariant method. This method makes use of the ByteArray::Grower class in order to dynamically grow the destination buffer for the decompressed data. After a successful growth of the destination buffer, the destructor of the Grower class will notify all the subscribers of the compressed ByteArray that they must use the newly-grown buffer. One example of a subscriber for a ByteArray is the global ApplicationDomain.currentDomain.domainMemory property, which can be set to hold a global reference to a given ByteArray. The purpose of ApplicationDomain.currentDomain.domainMemory is to provide fast read-and-write operations over the actual data of a ByteArray by using low-level AVM instructions from the avm2.intrinsics.memory package, like li8/si8, li16/si16, li32/si32, etc. A problem arises when the inflate() function of the zlib library fails because the data in the ByteArray is not valid zlib-compressed data. In that case, the ByteArray::UncompressViaZlibVariant() method will do a rollback, by freeing the grown buffer and restoring the original data of the ByteArray. However, it does NOT notify the subscriber (ApplicationDomain.currentDomain.domainMemory) that the grown buffer has been freed, so ApplicationDomain.currentDomain.domainMemory will keep a dangling reference to the freed buffer. Let's dig in the source code of the ActionScript Virtual Machine and see what happens under the hood when we call the uncompress() method of a ByteArray object from ActionScript code. When we try to decompress the data of a ByteArray, the ByteArray::Uncompress() method of the AVM (defined in core/ByteArrayGlue.cpp) will call a decompression function according to the compression algorithm that was used to compress the data. We are going to focus on the zlib case. // 2) put the original data back. But note that no one notifies the subscribers that the new buffer has been freed! So ApplicationDomain.currentDomain.domainMemory will keep a reference to that buffer even after it has been freed because decompression failed. We can later dereference that dangling pointer, so this is a use-after-free vulnerability. By doing li32(0x20) we can read the dword stored at offset 0x20 of the Vector object, which is its vtable; having read the address of the vtable is enough to determine the base address of the Flash module, allowing us to bypass ASLR. By doing si32(0xffffffff, 0x24) we can overwrite the dword stored at offset 0x24 of the Vector object, which is its length. Setting this new length will allow us to read/write from/to any memory address within the address space of the browser process, if needed at all. I didn't need to modify the Vector length in order to exploit this vulnerability on Windows 7 SP1. Then we build our ROP chain as a ByteArray, and we store it as the first element of the Vector (no metadata is overwritten here). This ByteArray object with out ROP chain is stored as a tagged pointer. But what's a tagged pointer? Flash adds information about object pointers in the 3 least significative bits, as described below (taken from Haifei Li's presentation from CanSecWest 2011). In order to read the dword stored at offset 0x40 of the ByteArray object I decided to use a technique explained by Nicolas Joly from Vupen, which consists of modifying (tagging) a pointer so it is interpreted as a pointer to a Number (IEEE-754 double precision) object, thus creating a type confusion that will provide us with a primitive to read 8 bytes from an arbitrary address. First we tag the address we want to read from as a pointer to a Number object (OR'ing the address with 7 - see the tags table above). That's how we create the confusion. Then we store this fake pointer-to-Number-object in the elements array of the Vector by doing si32(fake_number_object, 0x2C). After that we grab that fake Number object (this.the_vector in the code below) and write it to an auxiliary ByteArray; this way the 8 bytes stored at the arbitrary address we want to read from are stored in the auxiliary ByteArray. 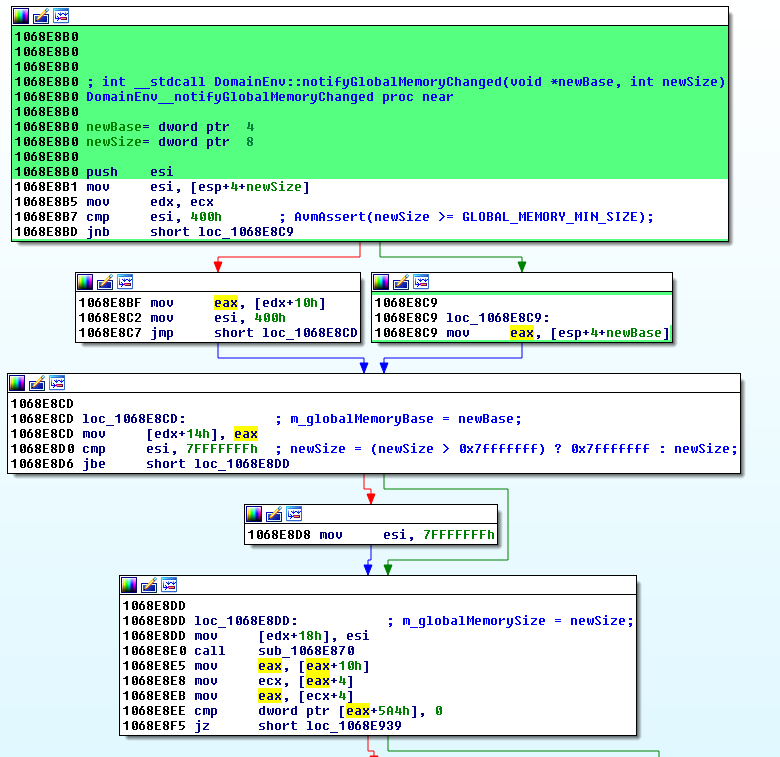 The use-after-free vulnerability analyzed in this post can be leveraged to read and modify arbitrary memory in the address space of the browser process, allowing the attacker to bypass protections provided by the operating system like ASLR and DEP, ultimately leading to the execution of arbitrary code. However, you should note that the exploitation process described in this blog post applies to Windows 7 SP1, but it will not work on Windows 8.1 Update 3 (released November 2014). Why is that? Well, in Windows 8.1 Update 3 Microsoft introduced a new exploit mitigation technology called Control Flow Guard (CFG). CFG injects a check before every indirect call in the code in order to verify if the destination address of that call is one of the locations identified as "safe" at compile time. If that check fails at runtime, the program detects an attempt to subvert the normal execution flow and exits immediately. It turns out that the Flash version that is integrated into Windows 8.1 Update 3 is compiled with Control Flow Guard enabled, so in the last exploitation step, that is when we overwrite the Vector vtable and call the toString() method of the Vector object in order to modify the execution flow, the CFG check function will detect our fake vtable and finish the process immediately, thus preventing our exploitation attempt. That means that exploitation of this Flash vulnerability on Windows 8.1 Update 3 targets introduces a new hurdle: bypassing the CFG protection. Spoiler alert: we did managed to bypass CFG in order to successfully exploit this Flash vulnerability on Windows 8.1 Update 3. So stay tuned for a new blog post with a detailed explanation of how we did it!